If it’s your first time in Chicago, you’re bound to be excited. It’s such an amazing city that’s bursting with energy, art, culture, and dining. The only problem? There’s too much to see in a short period of time! Of course, you can always plan another trip in the future, but if you’re limited on minutes and it’s your first time as a visitor, you’ll want to make the most of your trip and head to the top destinations. Here’s a Chicago bucket list guide—giving you the best Chicago experiences when you’re brand new to the city. Right in the heart of downtown Chicago, Millennium Park has beauty, entertainment, dining, and nature, making it a top spot to visit during your stay. You can splash around in water by Crown Fountain, grab a bite to eat, take a casual walk or bike ride, or buy tickets for a performance. You’ll also want to snap a photo at the Bean and take a walk through Maggie Daley Park. In the summer, you can enjoy dance, music, and movies on several evenings, so be sure to check the calendar for updates. The Lakefront is beautiful and gives you access to various neighborhoods and views of the city. You can grab a bike and take a leisurely ride along the path or you can lace up your gym shoes for a run. You can also pack a picnic and sit out on the beach, if the weather’s in your favor. It’s a great way to be with nature and spend an afternoon. It’s also a prime area for a game of ball or catch, so get your gear ready for an active day of fun and play. There’s no better way to experience the city’s beauty and breathtaking scenery than by taking an architecture tour. If it’s in the spring or summertime, when the sun is out and temperatures are warm, hop on a boat cruise for a tour and sail. You can also try a water taxi, if you don’t want to book an architecture boat tour. 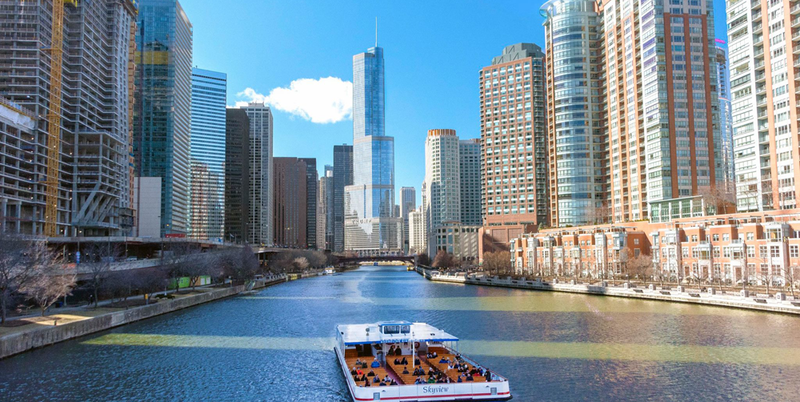 If you prefer to stay on land, you can also sign up for a walking architecture tour—you’ll get your steps in for the day and see some of Chicago’s renowned buildings. The Magnificent Mile on Michigan Avenue is known for its high-end, luxury retail, and it’s the perfect place to do some damage to your wallet when visiting the bustling city of Chicago. There are so many outlets for art and culture within Chicago, thanks to its abundance of museums. You can visit the Art Institute of Chicago, where there are several exhibits, demonstrations, and educational opportunities listed on the event calendar, or you can channel your inner scientist at the Museum of Science and Industry. And, if you love modern art, Museum of Contemporary Art is the place for you—collections feature Andy Warhol, Jeff Koons, and more. No trip is complete without a taste of deep-dish pizza, a great donut, a Chicago dog, or a bag of Garrett’s popcorn. Try Giordano’s or Lou Malnati’s for a big ol’ pizza pie and stop by Portillo’s for a Chicago hot dog—no ketchup, of course. For donuts, Stan’s Donuts and Do-Rite Donuts have a great selection, ranging from sweeter items, like Peanut Butter Banana Pocket, from Stan’s, to savory, like Candied Maple Bacon, found at Do-Rite.